I'm super excited to introduce you to all of my friends! Everyone, this is Homer. Homer, this is everyone. Some of you kitties might recognize Homer, a.k.a. The Blind Wonder Cat. In fact you may have even read his story, Homer's Odyssey, A Fearless Feline Tale, or How I Learned About Love and Life with a Blind Wonder Cat, written by Gwen Cooper, his human companion, guardian and student. Well you're in for a treat! 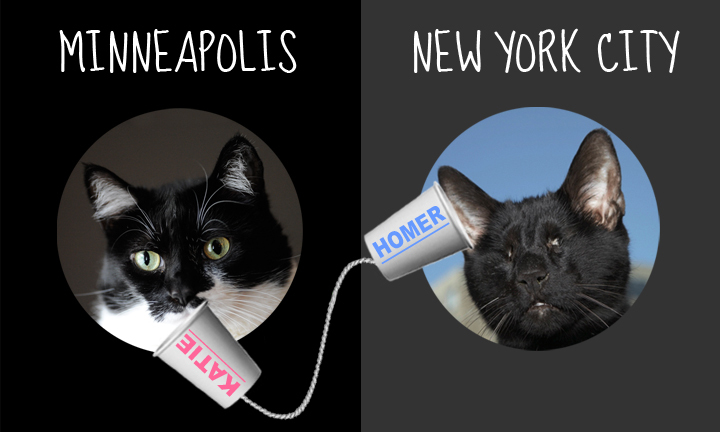 Today's blog post is dedicated to Homer, Gwen and the cats of Blind Cat Rescue. Last week in a very special blog post, Glogirly and I had the honor of featuring Blind Cat Rescue & Sanctuary, the shelter we are supporting in the Campaign for a Cause Contest. As Glogirly talked on the phone with Alana Miller, the amazing woman behind the North Carolina rescue organizaton, it became clear how much Gwen, Homer and their story meant not only to her and Blind Cat Rescue, but to humans and cats all over the world. "Gwen has made a tremendous difference in the lives of blind cats. She has managed to change the mindset of if you're blind you're dead." Alana explained how Gwen had opened people's minds and hearts to the idea of adopting a cat who might otherwise be euthanized simply because they couldn't see. We just knew we had to find out more. So what does any curious and resourceful cat with internet access do? I sent her a Facebook message, or course. I arranged for a meet-and-greet between Gwen and us. Not being much of a phone talker, I quickly turned it over to Glogirly for the heavy lifting. In the summer of 2008, when Homer was a strapping 11-year-old, Gwen was putting together a book proposal for Homer's story. She needed some statistics on blind cats. Although there wasn't much concrete information to be found, an easy Google search turned up Blind Cat Rescue & Sanctuary in St Pauls, North Carolina. That's when she met Alana Miller, Director of BCRS. They talked on the phone for a long time and became fast friends. In our previous post about Blind Cat Rescue, Alana described Gwen as her inspiration. Gwen was quick to correct that, letting us know that is was actually Alana who provided the inspiration. In 2009, Gwen's story of her blind wonder cat became a reality. Just two weeks after it's release, Homer's Odyssey was a New York Times best seller. Clearly readers were responding to her heartwarming message and a little black cat you couldn't help but fall in love with. The first stop on Gwen's paperback launch tour was Blind Cat Rescue, where she presented them with a check for $10,000 from the royalties of Homer's Odyssey. 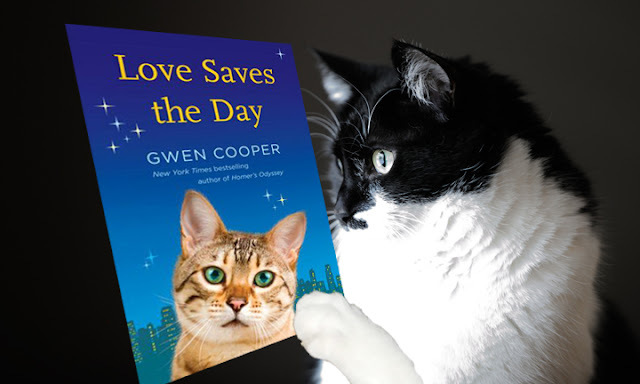 Gwen continues to donate 10% of her book royalties to homeless pets in need. She talked about how this past year has been particularly devastating for pets affected by natural disasters and extreme weather. She's been able to make a difference for pets in these tragic circumstances. When we asked Gwen to tell us who has inspired her the most, other than Homer of course, she had a very hard time pinning it down to any single person. At home, her husband keeps her going and provides encouragement when she's down. But it's the people on the front lines, like Blind Cat Rescue's Alana Miller, who do incredible things everyday and work tirelessly to make a difference. THEY are her inspiration. Gwen describes Homer, now a dignified 15, as the elder statesman of blind cats. "Although he's mellowed with age, he still has his moments of rambunctiousness. Sometimes he'll meow and meow because he's just so bored." That's when Gwen is quickly reminded it's her job to entertain him. "He must have some Siamese in his blood with vocal cords like those!" Just last April, the cat family expanded when Homer "welcomed" in Clayton and Fanny, all-black, and definitely all-kitten, litter mates. Clayton has three legs and a charming "sideways run," as Gwen puts it. For the most part, Homer "leaves them to their kittenesque antics unless something with catnip is involved." Considering A Special Needs Adoption? 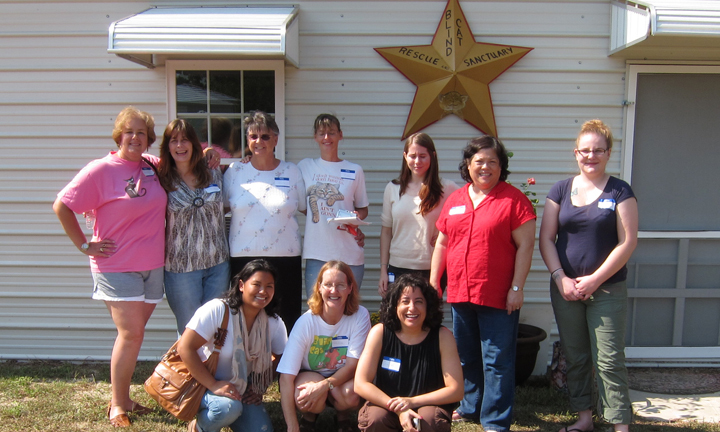 Gwen reminded us that special needs is such a broad umbrella. 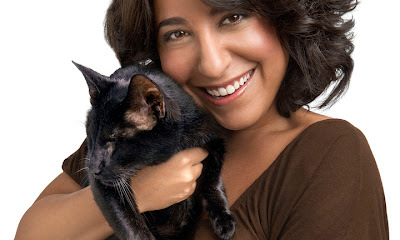 "It can mean a cat with three legs versus one that needs to be medicated many times a day." She urges those thinking about adoption to "consider your lifestyle, your time and the kind of home you can provide. But most importantly, at the end of the day it's just a cat and capable of living life as any other cat." Gwen has a terrific FAQ about living with a blind cat on her WEBSITE. If you haven't heard, Gwen has a new book coming out early next year! Love Saves The Day is a novel told primarily from the perspective of the family cat. (something we can all relate to!) It's about a mother and daughter who have a difficult relationship and the cat that becomes the bridge between them. 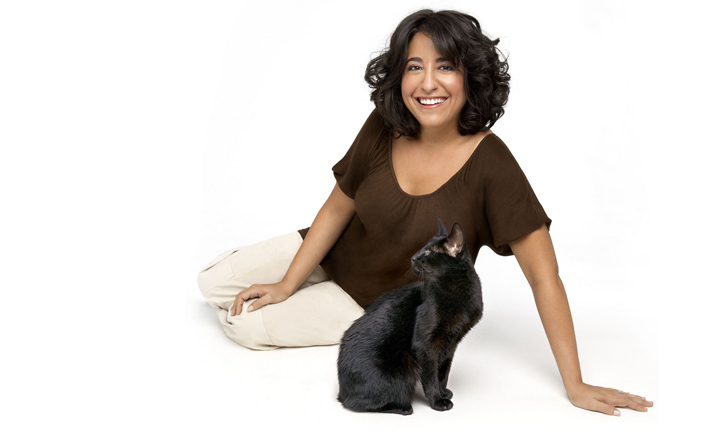 The mother and daughter narrate about a third of the book, the family cat the rest. Gwen was surprised how challenging it was to flip back and forth between voices, getting the vocabulary just right and species-appropriate! "Would a cat say that??? They'd never use that word..."
Glogirly and I have the same thing to say about this one though - We can't wait! I was kind of nervous, kept my head down a little, brushed my front paw from side to side. I think I almost stuttered. Embarrassing for a cat with my confidence. I asked Homer if he wouldn't mind endorsing me in my campaign for the blind cats. And guess what?! We're very excited to give one lucky reader a copy of Homer's Odyssey, A Fearless Feline Tale, or How I Learned About Love and Life with a Blind Wonder Cat! If you already have it, we bet you know someone who'd love it. And if you don't have it....well, what are you waiting for? Just leave a comment letting us know you'd like to be included in the random drawing and an email address we can reach you at. Deadline for entering is midnight, 9/11 CST. Cathy Keisha and I are hosting a Get-Out-The-Vote Twitter Pawty this Monday 9/10 from 7-10pm EST. It's all to raise awareness for Blind Cat Rescue and rally votes for the blind kitties. There's even going to be some awesome GLOGIRLY DESIGN prizes! Click here for the #Vote4Katie Twitter Pawty Invite and visit StunningKeisha.com for even more info on the pawty. Voting starts in just a few days! Whoa, maybe I's getting lucky. I want to be entered to win tha neat book about Homer. Not sure what info you need about me, but I's on the Cat Blogosphere at KC at catblogosphere DOT com. Love love love tha campaign poster wif Homer's words of wisdom. O, that cats could rule the world. What a better place it would be. I so loved Gwen's Homer's Odyssey! I laughed and cried, it was very touching. I certainly fell in love with sweet Homer. I'm thrilled to hear Gwen's got a new booking coming, she has a great writing style. Since I already have the book on my shelf, I'll let some other lucky cat win and enjoy the great heart warming story. We'd like to enter the competition too. Mum has already read the book and loved it, but has some friends who would love a good read. We love black kitties, and Homer is the sweetest kitty ever! Good luck with all your efforts Katie! It's a great story (we've read it, so please don't enter us), so we donated a new copy to the CB auction for Krasota Castle. Blind Cat Rescue does a wonderful job helping kitties. Purrs. 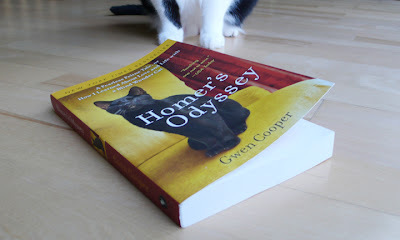 I've known about Gwen's association with Blind Cat Rescue for a long time now (I reviewed Homer's Odyssey a while back), and I really hope to be able to give back someday with my books on the kind of level she and Homer have done! We won't be entering the draw so good luck to everyone who does! We have Homer's Odyssey, too. What a wonderful book! We aren't entering, but we wanted to say we are so glad Homer is endorsing you in the campaign. He is awesome! Thanks for that great interview about Homer, Katie! We love him!! And though we know about his book, the mom hasn't read it yet, so we would like to enter. We would love to enter the prize draw for Homer's Odyssey please. We know our Mum had a cat who went blind in her old age and it was in fact a few weeks before she realised as she was still jumping up on the tops as she always had done! What a wonderful story, Katie! Thank you for introducing us to Gwen. I can't believe I am saying this, but I have not read Homer's Odyssey yet and MUST do so. Despite all the doom and gloom and how it may seem on the surface, there is so much love and compassion in this world and these kind of stories should be the headlines and not the one's that leave us feeling depressed and helpless. Homer da mancat!!! He knows who to support! I didn't even line his pockets with salmon. heh heh! Can't wait to pawty. This campaign is going swimmingly. Loved this post. We have a copy of the book and have read it. One of TW's fave books ever. We wish we could meet Homer. It's all about the Blind Cats, not us. What a great interview AND cause! We already have Homers book so don't enter us. We wish all kitties could have a home and there would be now more suffering or homelessness. A tall order, but we can all do our best, like Gwen and Glogirly & Katie to help our own little corners of the world. KATIE! That is my MomKatt in the picture! The lady on the left in the pink T-shirt!!! OMC OMC! And you were endorsed by THE BEST! MomKatt's met Miss Gwen & says she's a pawsome hooman! Katie, this whole election cycle is the first one EVER that Mommy has enjoyed! We think Cats should rule the UNIVERSE. This book has been our wish list a long time so please enter us. I love Homer, Gwen and their story. Really special kitty and extra special human. I interviewed Homer for my blog a few months back. He's very articulate! MOL. Homer is one exceptionally cool dude! We think it's pawsome you find our bloggie much fun! We luvs you, too. Are you in luv wiz Homer? If you are, we would totally understand. Homer is very handsum! Homer and Gwen rock! Of course we would like to be entered in the drawing! We can't wait for the next book! Me too want´s to be included in the random drawing ! Wow, you really went all out! We love Gwen & Homer and are waiting for the ARC to review. Would love to win this book, can't wait to read it, but if I don't win it then I will go out and buy it. Thanks for all the great work you do. We love Homer's story (since we have the book already, we are opting out of the drawing). A word of warning to people who have not read it yet: be prepared to cry, laugh and totally fall in love with Homer! We just stopped by to say how much we ADORE Gwen and Homer! Please don't enter us because Gwen's book was the FIRST book review ever for Cat Chat...it paved the way for many more! I would love to read either book!! I just love the way that you're handling your campaign too! Pawesome endorsement! Homer and Gwen are the Bomb!! You can count on this ManCat's vote, my sweet Katie! Count us in! I read the book years ago (my first cat book) and was so inspired. Would love to win one as a gift for next person who adopts one of our kitties! Dear Katie, Me has shared this post! Me has always thoughts Homer was pretty special! BUT -- Me is still Austins's Campaign Manager and me is STILL promoting Fairdields in england! We would all love to have a chance to read this amazing book in our house. 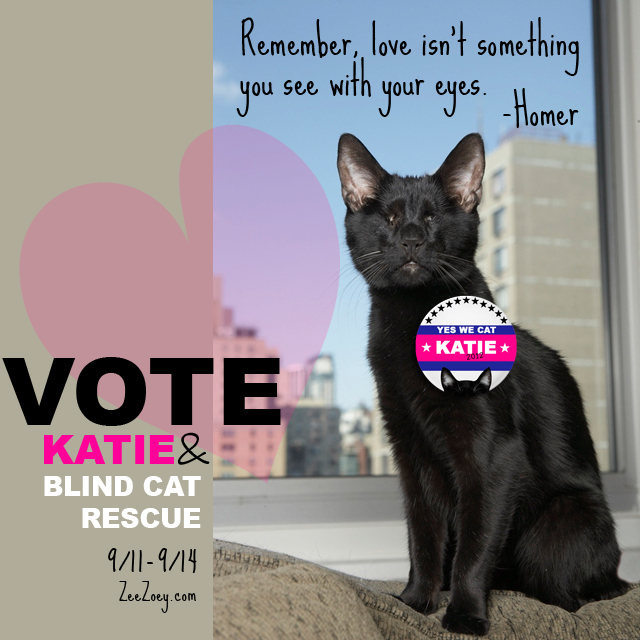 Our sister has occular siezures & our little brother has one eye, we are 'Team Katie' all the way-The Blind Cat rescue is so amazing, we'll be rallying votes to help in any way we can! mom's email is barkergirl33(at)yahoo.com (we DO not have any canines-our brother's name is Barkerman...mom's wierd!) Thank you!! Count me in! I'd love to read Homer's story. Homer sound like an interesting cat. We would love to read about him, so please count us in. We appreciate you running for a cause, Katie. Good luck. I have two black furbabies who are sisters, Smokey and Mischeif and my calico Ivy girl. We would love to be entered in your contest to win the new book. We love you Homer!!! oops forgot to leave my email. 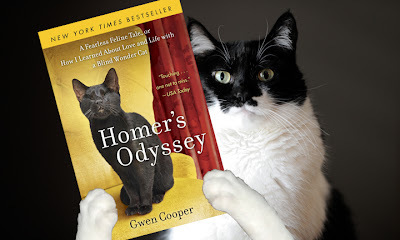 My mom and I would love to learn more about Homer from his wonderful book! We will be voting every day! Good interview, Katie and Glogirly. Thank you for introducing Homer and Gwen. We LOVE books, especially ones about cats and black cats are the bestest! love mew Batgirl, er, I mean Katie. We loved this book but have plenty of cat-loving friends who haven't read it, so we'd love to pass along a copy! :-) It was cool to see a photo of Homer with his girl. Our person's childhood cat was blind in one eye, but it did not slow her down. We've always known that cats are awesome animals, handicap or not! Our mom loves to read and she would love to win this book. She hopes its not too sad, though. I was deeply touched by the book. Gwen's account of the harrowing and emotionally wrenching experiences on 9/11 and the days following brought tears to my eyes! does a box of tissues come with the book? i have a feeling whoever wins will need it. You Want Me To Do WHAT To Myself?